October ushers in the change of seasons and the final days of the summer garden. It’s a time of gathering in the late tomatoes, the finally ripening sweet and hot peppers, shiny eggplants, and the plump tomatillos hiding under their sprawling vines. The days are warm and dry, and these fruits seem to hold a whole summer’s worth of goodness. It’s time to capture some of this exuberant flavor to brighten winter days. Arthur Schartz’s book, The Southern Italian Table, is full of authentic recipes from traditional kitchens. It is especially valuable because the recipes come from a land of farmers, where local produce is celebrated and ingeniously delicious methods are used to preserve garden fresh flavor for the whole year. Schwartz has spent a lot of time with cooks who need to find enticing ways to use an abundance of zucchini, mountains of red peppers, piles of eggplant, and cascades of red onions. When I want to save all the goodness of the late summer garden, I go first to this cookbook to see what the Southern Italians do. Conserva is what they do. I love the Italian word conserva, a word that brings to mind images of sun-drenched tomatoes and peppers, full of deep flavor and aroma, as well as the long sunny days that concentrate the tastes and smells to store away for winter. 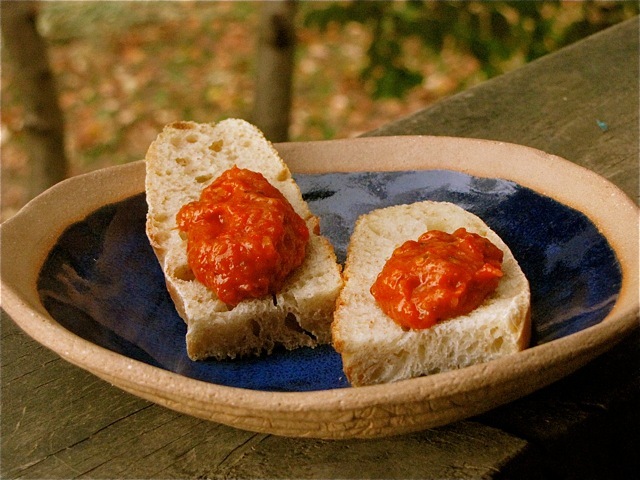 In Italy, conserva is a thick paste, traditionally made by drying a vegetable puree on large trays in the sun. The paste is packed into glass jars or crocks, sealed with a layer of olive oil, and stored in a cool stone cellar. I use the term conserva loosely to include various intensely flavored preparations that can be stored for weeks or months in the refrigerator, freezer, or cold deep cellar. Conserva can be used as a relish, spread on bruschetta, or added by the spoonful as a “secret ingredient” flavor enhancer to other dishes such as polenta or risotto, soups and stews, or lentils and beans. The instructions for making traditional tomato paste and sweet pepper paste are found in Rosetta Constantino’s cookbook, My Calabria. In her grandmother’s day, the women didn’t know about water-bath canning, so they preserved their tomatoes and peppers by cooking them to a thick puree, straining it through a food mill, and adding salt and sun. I don’t rely on the sun to dry my conserva. Instead, I use a low-temperature oven for slow roasting tomatoes and peppers to get rich, deep, toasty flavor. These vegetables freeze beautifully and can be used for anything from pizza toppings and salads to making a chunky or smooth paste or sauce. These are so easy and delicious! I have written about them several times, but they deserve more publicity. The very best batch I have made was slow roasted in the wood-fired oven after baking bread, but a regular oven works fine. I use small plum tomatoes like “Juliet”, as well as paste and large cherry tomatoes. Any dense, meaty tomato (preferably vine ripened) will work. Heat the oven to 350 degrees F. Cut small tomatoes in half, larger tomatoes in slices about 1/2-inch thick. Place the cut tomatoes on a rimmed baking sheet and drizzle with olive oil. Roll the tomatoes around gently to coat both sides and arrange them in a single layer, cut side up. Season with a little kosher or sea salt. Place in the oven and lower the heat to 225 degrees F. (You can leave the oven at the higher temperature if you are in a hurry, but you have to be watchful). Check on them after 1 1/2 hours and rotate the pans if necessary. Slowly roast the tomatoes until they are wrinkled and starting to brown on the bottoms, but still a little juicy–2 to 5 hours, depending on type and juiciness of the tomatoes. Slow roasted tomatoes are a great partner for slices of fresh mozzarella and basil leaves, either on crusty bread or topping a pizza. Or, combine them with pancetta, red chile, and parsley to toss with pasta. They are great in tabouleh or couscous, in a frittata, or on a salad of spicy or bitter winter greens. Any extra roasted tomatoes may be slipped into freezer bags and frozen. Succulent and lightly caramelized, roasted sweet peppers are a wonderful treat to store for winter. This is an especially good way to preserve thin-walled roasting peppers. I grew Jimmy Nardello, Corno Rosso, and Big Red sweet peppers this year. 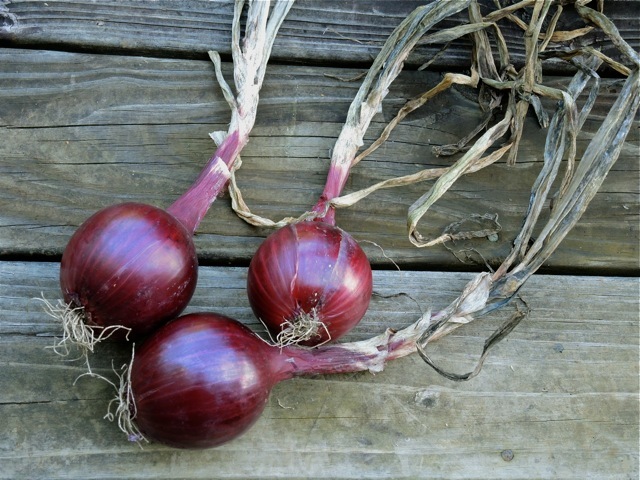 Jimmy Nardello was the star for early ripening and being prolific over a long season, though both Corno and Big Red are larger and have thicker-walled fruits. The conserva we ate in Italy was made with celery and onion, as well as peppers; add what you like. Heat the oven to 325 degrees F. Cut sweet red peppers into 1/2-inch strips (or chunks of equal size), discarding seeds and stems. Cut celery into 1/2-inch dice, and onion into 1/2-inch wedges. Peel garlic cloves, but leave them whole. Toss the strips (and optional additional vegetables) with olive oil to coat all surfaces well. Sprinkle with a little kosher or sea salt and toss again. 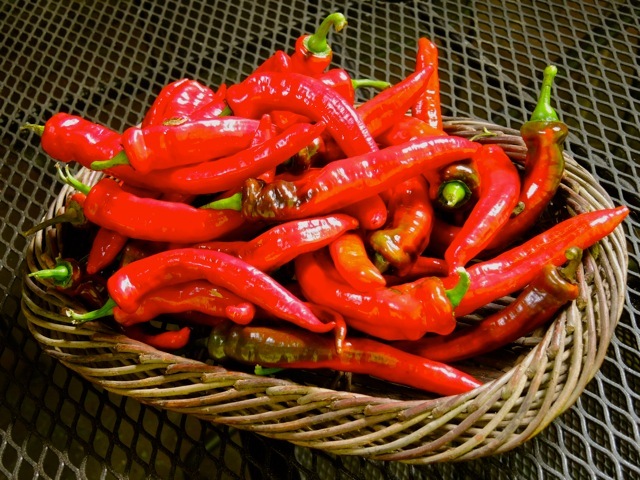 Spread the peppers on baking sheets or roasting pans. Place the pans in the oven and slowly roast 1 to 1 1/2 hours, until the peppers are soft and the skins are beginning to brown in patches. Times will vary, depending on the thickness of the peppers. The roasted vegetables may be frozen just as they come out of the oven (think pizza or polenta topping) or they may be chopped in a food processor to make a coarse or smooth paste. I like to add crushed fennel seed and a hot chile or two to my conserva. Store conserva covered by 1/4-inch olive oil in a sterilized and tightly sealed jar in the refrigerator for several weeks, or in the freezer for several months. The word stuzzico is used to mean “snack,” Arthur Schwartz explains, and this tasty roasted vegetable spread is meant to be served with bruschetta or crostini as an antipasto. The recipe he gives in The Southern Italian Table calls for a generous amount of wine vinegar and olive oil, which help to preserve the spread when stored in the traditional way–in crocks or jars topped with a layer of olive oil, kept in a cold cellar or refrigerator. My taste for vinegar has declined, so I adapted his recipe to suit my taste buds and find so many ways to eat it that long-term storage isn’t an issue. Heat the oven to 375 degrees F. Cut the eggplant into 1-inch cubes, seed the peppers and cut into 1-inch wide strips, cut the onions into 1-inch wide wedges, peel and lightly smash the garlic. Put the vegetables in a large bowl and drizzle with about 4 Tbs olive oil. Sprinkle with salt and toss to coat well. Scrape the mixture into a large roasting pan. Roast 35 to 45 minutes, stirring once or twice, until the vegetables are tender. While the vegetables are still warm, add the vinegar, chile, and herbs. Allow to cool before using a food processor to chop the stuzzico to a chunky or almost smooth puree, as you prefer. Season with salt and vinegar to taste. Add olive oil as desired. Store stuzzico in sterilized jars, topped with 1/4-inch of olive oil in the refrigerator for a week or two. Freeze for longer storage. Peel the onions and cut them in half lengthwise. Cut them lengthwise into very thin slices. Warm the olive oil in a large skillet over medium heat. Add the onion and sprinkle with salt. Stir well, cover the pan, and reduce the heat to low. After about 5 minutes, uncover the pan and continue to cook slowly, stirring frequently, until the onions are golden brown and very soft, 30 to 40 minutes. Add the vinegar, thyme, pepper, and optional roasted garlic. Stir and cook 1 or 2 more minutes, until the liquid is gone. 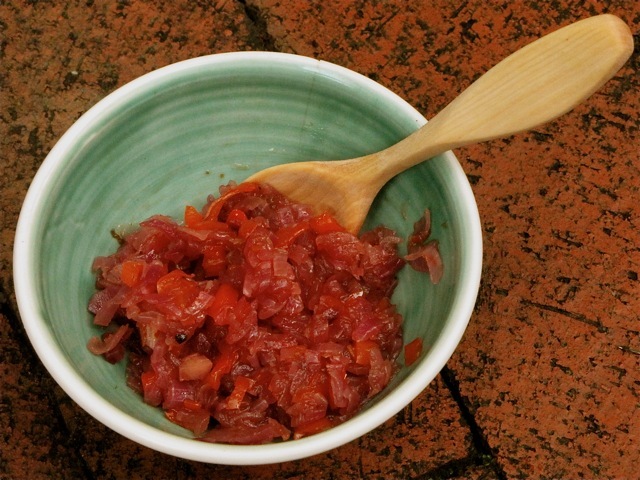 Onion marmalade is a delicious topping for bruschetta, focaccia, or polenta. 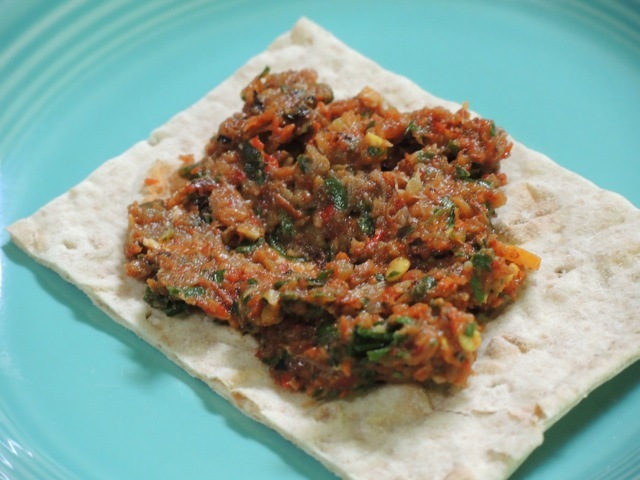 Use it as a condiment for grilled meats or burgers, in sandwiches, or with eggs. The marmalade will keep in the refrigerator several weeks. Please note!! All these conserva are most delicious when freshly made, so don’t postpone joy! Eat them immediately. If you are so fortunate to have a surplus of vegetables, make extra to store for winter. Rice balls could be thought of as the Japanese equivalent of a sandwich. Take a handful of rice, pat it around a savory filling, wrap it in nori, and you have a delicious meal or snack. Our friends in Japan make rice balls (onigiri) for lunch, to carry on outings or to work, and to send home with us on the airplane so we have something good to eat. While Hisayo was visiting, I asked her to show me how to make them so we could serve them to the Japanese woodworking class for lunch. Onigiri are fun to make as well as to eat, and it’s fun to stuff your mouth with all the Japanese words, too. Rather than seasoning the onigiri rice with salt, I like to sprinkle them with gomashio (a condiment of toasted sesame seeds and sea salt) or furikake (translated as “rice seasoning”). Furikake is an ingenious mixture of crunchy dried flavorings to sprinkle over plain rice. The ingredients vary–wasabi fumi furikake features wasabi, and katsuo fumi furikake features shaved bonito flakes. Other ingredients include sesame seeds, seaweed, mustard or other green s, tiny dried fish, soy sauce, and sake or mirin. I learned about furikake from Tombo (“Dragonfly”), a woman who runs a very small restaurant in Japan. Dragonfly is a master of sprinkles and garnishes. She makes curls and flowers from carrots, turnips, and daikon (dyed pink with beet pickle juice), deep-fried vegetable chips, and pickles of all kinds. She loves the beautiful organic produce that she buys from a friend’s farm and doesn’t want to waste any of it, so she makes her own furikake with the dried tops of root vegetables. It’s a lovely and delicious way to preserve the goodness of frilly young carrot tops, little beet leaves, and tender turnip or radish leaves. I love that she makes something unique and delicious out of things other people might throw away. Our rainy, cool summer has produced a bumper crop of kale, so I have been turning lots of it into kale “chips.” This is an easy way to turn armloads of kale into tasty tidbits that can be stored in jars on a pantry shelf. I love the salty, sweet, savory flavors of furikake and decided that they were a perfect way to season the kale. After trying a soy-mirin-sesame batch, I experimented with chile-garlic, mustard-balsamic vinegar, dukkah (an Egyptian nut and seed blend), and za’atar (a Middle-Eastern seasoning blend). All did wonders for the kale, and I can’t wait to try Thai ginger-lime, Mexican chipotle-garlic, and Indian curry spices. 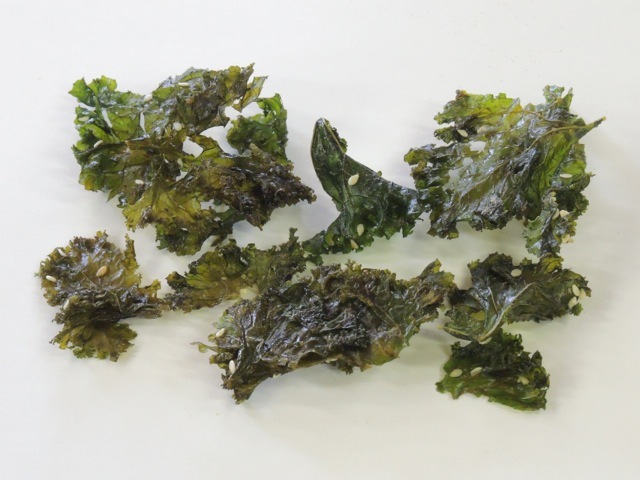 Kale chips are not something everyone wants to eat in quantity. My friend Liz eats them every afternoon for her pick-me-up snack, but my sister Ellen describes them as a great food that you only want to eat every three years. Mixing kale chips with other ingredients to make a furikake blend to sprinkle on top of salads, rice, lentils or beans–any time you want a vitamin-rich burst of flavor and crunch–is a good solution. 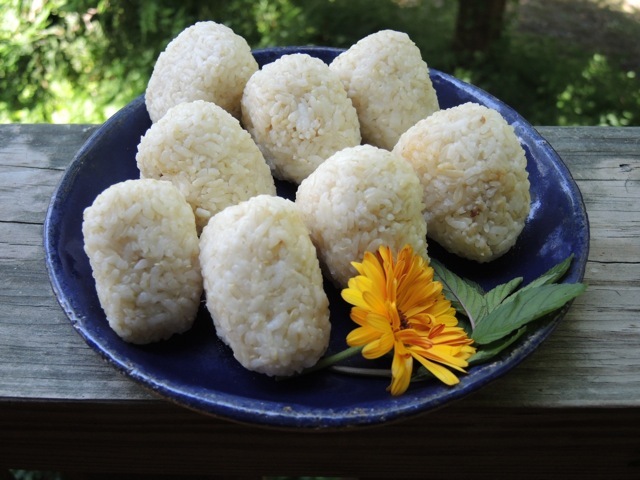 Onigiri may be made with any medium grain rice, white or brown. We used “haiga” rice–a Japanese medium grain rice that has been milled to remove the bran, but retains the germ. It is more tender than brown rice, but more flavorful than white. The ratio of rice to filling is about 8:1, so the filling ingredients tend to be strongly flavored. Onigiri may be eaten with or without the wrapping of nori. Hisayo served hers unwrapped, with a sprinkling of sea salt. I put a bowl of Ssamjang on the table, too. Wash the rice in several changes of water (do not wash haiga rice). Drain and transfer to a saucepan with a tightly fitting lid. Add the cooking water to the rice and allow to soak 30 minutes. Bring the water to a boil, boil 15 seconds, then cover tightly and turn the heat to the lowest possible setting. Steam the rice undisturbed until all the water has been absorbed and the rice is tender– 15 to 20 minutes for white rice, 45 minutes for brown rice. Remove from the heat and allow the rice to stand, covered, for 10 minutes. Fluff gently with 2 chopsticks or a fork. 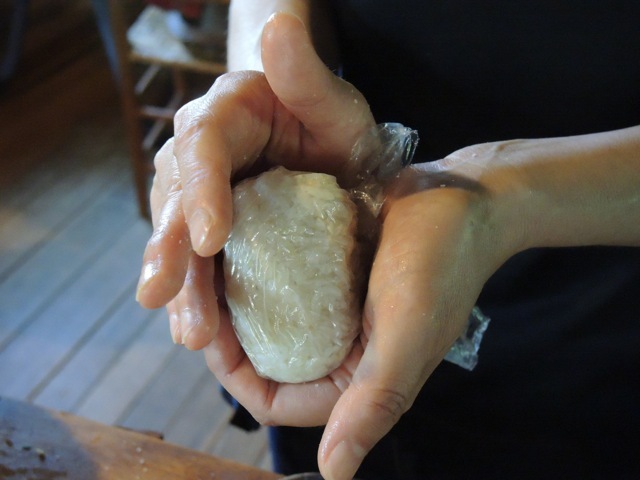 Hisayo uses a small rice bowl to help assemble the onigiri. Following her method, line the bowl with plastic wrap and fill it with a 1/3 to 1/2-cup scoop of freshly cooked rice. Press 2 to 4 tsp (or more, to taste) filling into the center and smooth the rice around it. Lift the plastic-wrapped ball out of the bowl and cup it in one palm. 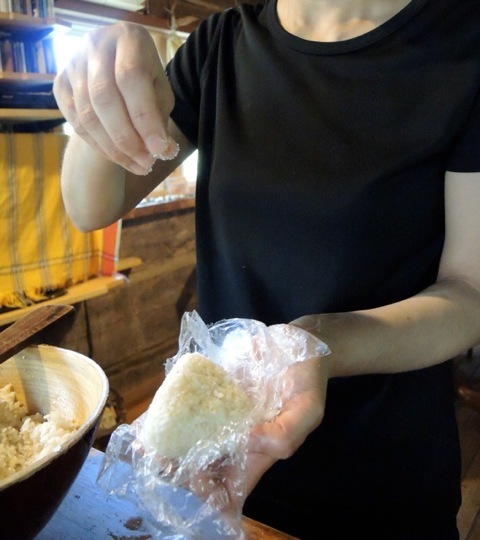 Use the other hand to press and compact the rice into a rounded pyramid shape by rotating and squeezing. Place each rice ball onto a platter and sprinkle with a topping of your choice–sea salt, toasted sesame seeds, gomashio, or furikake. Serve with a stack of nori sheets (cut in half or quarters) for wrapping. Gomashio: A seasoning made with toasted white or black sesame seeds and sea salt, generally in a ratio of 7 parts whole seeds to 1 part salt (or about 2 tsp salt for 5 Tbs sesame seeds). Heat a heavy skillet over medium high heat. Add the salt and roast, stirring constantly, for 1 minute. Add the sesame seeds and reduce the heat to low. Roast the seeds for about 3 minutes, shaking the pan and stirring constantly until the seeds are fragrant and beginning to pop. Transfer the sesame-salt mixture to a mortar and coarsely grind with the pestle, leaving 10 or 15% of the seeds whole. 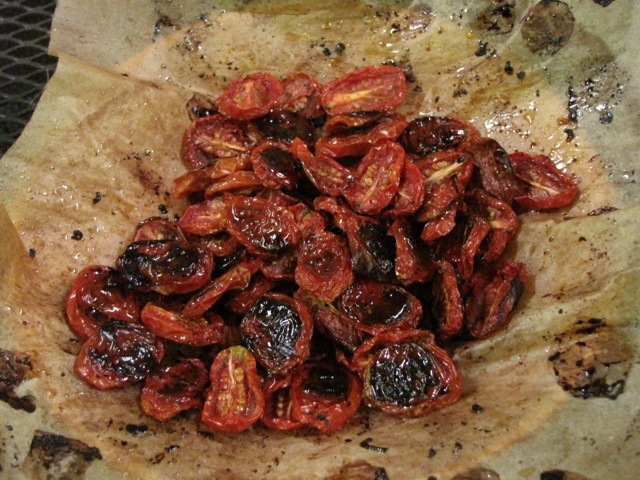 A second method: Like oven-dried, jammy tomatoes, kale chips may be made slowly at a relatively low temperature, or more quickly in a hotter oven. Liz makes her chips slowly in a food de-hydrator, while other folks roast them at 375 degrees, F. Prepare the kale as above. Roast about 5 minutes, or until it begins to dry a bit. Stir the kale around and flip it over, then return it to the oven and roast until crisp, another 7 to 10 minutes. Serve while still crisp, or store in a tightly sealed container. Sesame-Soy Kale Chips: Toss chopped kale with 1 Tbs mirin, 2 tsp soy sauce, 1 Tbs sesame oil, and 2 Tbs crushed sesame seeds. Oven-dry. Chinese Chile-Garlic Kale: Toss kale with 1 Tbs rice wine, 2 tsp chile-garlic paste, 1/2 tsp crushed Sechuan peppercorns, 1 Tbs peanut oil. Oven-dry. Mix with chopped roasted peanuts. Mustard-Balsamic Vinegar Kale: Toss kale with 1 Tbs grainy mustard, 1 Tbs balsamic vinegar, 1 Tbs whole mustard seeds, 1 Tbs olive oil, 1/4 tsp sea salt. Oven dry. Za’atar-Kale: Toss kale with 1 Tbs olive oil, 3 Tbs chopped fresh thyme leaves, 2 Tbs crushed sesame seeds, 2 tsp dried sumac powder (or 1 Tbs lemon zest), 1 tsp chopped fresh oregano or marjoram, 1/4 tsp sea salt. Oven-dry. 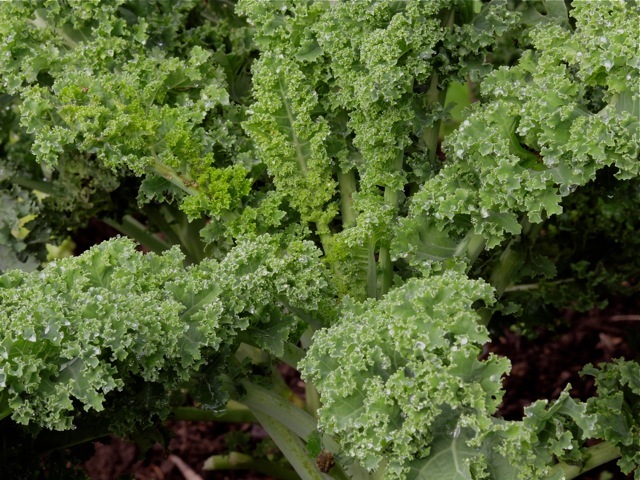 Dukkah-Kale: Toss kale with 1 Tbs sunflower or canola oil, 1 tsp lightly crushed fennel seeds, 2 tsp whole cumin seeds, 2 Tbs sesame seeds, 2 Tbs sunflower seeds, 2 Tbs crushed coriander seeds, 1 tsp sweet paprika, 1/4 tsp sea salt. Oven-dry. Mix with 1/2 cup chopped toasted hazelnuts or almonds. Note: Dragonfly does not have an oven and makes her dried greens for furikake in small batches. She blanches the greens a few seconds in boiling water, scoops them into a bath of cold water, drains them, and squeezes out the water. The greens are sliced thinly and stirred about in a hot skillet until dry. The crumbled dried greens are mixed with gomashio and tiny dried fish to make a furikake.